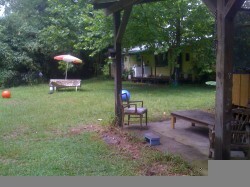 The Farm is an intentional community in Tennessee. It’s one of the first US communes. Lots of people from The Farm spilled out into places like Asheville, North Carolina and Gainesville, Florida as time marched on after the 60’s. Jose’ is one of these folks. These days, Jose’ is best known as The Tempeh Man ’round these parts. You’ll have a good time reading his website, http://www.tempehshop.com/ because the tone is a spillover of the energy you’d expect from a “Farm Graduate”. When I talk about “alternative lifestyles”, this is what I mean. So, my friend and favorite bike mechanic Musa and I drove out to Jose’s place on Independence Day. Jose’s got a piece of land that makes me almost cry with joy when I think of it. 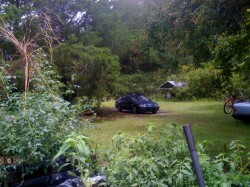 It’s everything that the book “5 Acres and Independence” dreams of, and no issues. None at all. 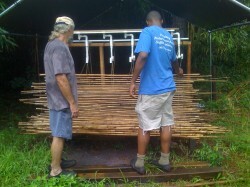 Before I tell you about the bamboo loom, please indulge me and let me show you around Jose’s place. 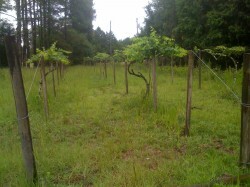 Jose’s got a sustainable finca that will make you happy, happy, happy! Here are a few shots I took. 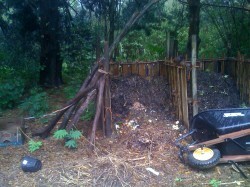 This is healthy compost doing what it does best: yep, that’s smoke coming from the decomposing pile of organic stuff. Next stop is Jose’s gardens. 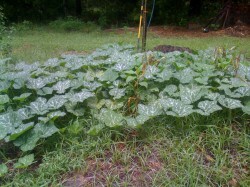 Here’s what happens when you take organic seeds, unbelievably fertile earth and caring hands. There are patches like this all over Jose’s place. 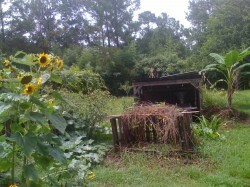 We did some wandering around, Jose’ and Musa and I, and admired plot after patch of the tastiest veg imaginable. You can see that Jose’s place is rambling and full of successful experiments. There’s Jose’ and Musa (left) admiring a tepee on his land. 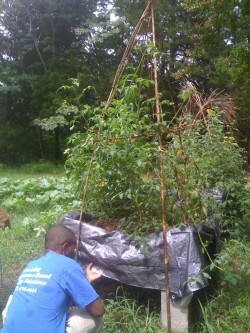 Here’s a raised bed garden Jose’ made using discarded carpets as a support. I could go on and on about these innovations and reuses, but we’d never get to the bamboo loom! We walked around and saw how 35 years out of the Farm and onto some land down south of Tennessee had evolved into this gem of a refuge, not too far from town, but far enough away so you could hear only crickets and owls if that’s all you wanted. 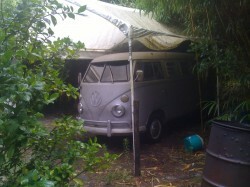 People who know me know I love these VW’s. I heard all about how Jose’ got this baby for a few hundred bucks many years ago. He took it completely apart and lovingly put it back together. It’s just what you’d imagine from an artisan like Jose. You can see the fine detail, the care put into it by hands that took time to do the job right. Musa and I made our way back to the bamboo grove. 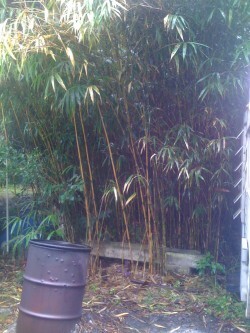 This is special bamboo, as Jose’ explained. It’s got a solid core. Jose’s growing a bunch of it on some land in the Yucatan. If you look around his website and FaceBook page enough, you’ll find out about that story, too, and the journeys he’s made from Florida down to Mexico to work on it. 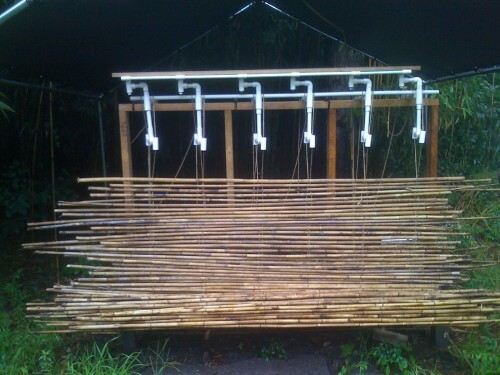 So, here it is: Jose’s PVC bamboo loom. This is a way to take already ultra strong bamboo, but even stronger because it’s uber-bamboo, and make it super useful. This is a closeup of the loom. 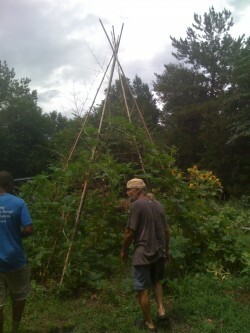 Basically, you put a bamboo pole in the 6 strands of twine and then tie it off. This is Loom-Use 101. Folks have been doing it for a long time. 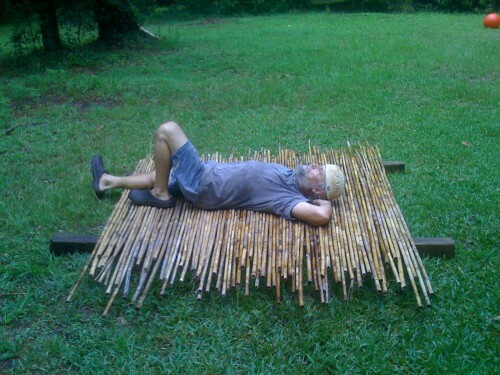 One use for the product of the bamboo loom is a strong, relaxing bed. You can make it just the right size for you and yours. 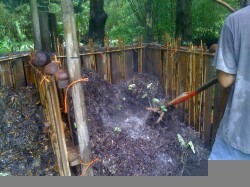 Another use for this bamboo loom product is fence. 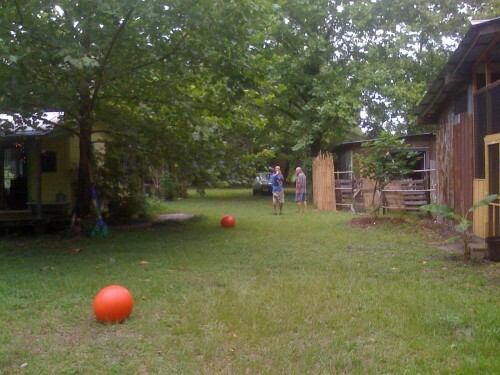 Can you see the beginnings of a nice fence beside one of Jose’s buildings? We each took a turn at feeding the loom. It was an amazing day. Thanks, Jose, for the food for thought. 1. Thich Nhat Hanh, Old Path, White Clouds (Berkeley, CA: Parallax Press, 1991), 121.